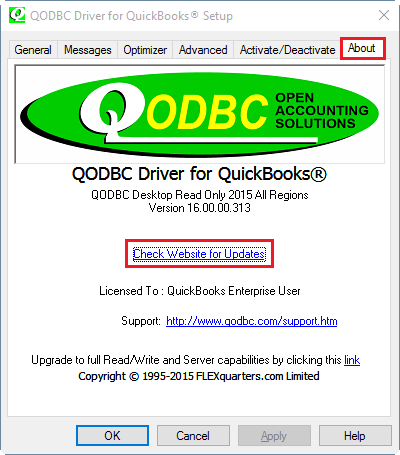 [QODBC-Desktop] QODBC Evaluation Period Expired after upgrade to Intuit Enterprise. QODBC Evaluation Period Expired after upgrade to Intuit Enterprise. An older trial installation of QODBC (from before QB Enterprise, and long expired) was once on this computer. 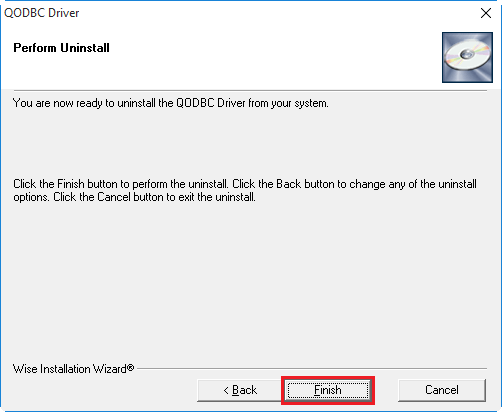 How do I proceed to install the QODBC driver included with QB Enterprise, and what (if anything) do I need to do to clean up or remove the expired trial edition? When we try to connect, the QODBC driver says "[QODBC] Evaluation license has expired" and requires an activation key in order to continue. To resolve this issue, You need to download the latest QODBC version. You can get QODBC latest version by clicking "Check website for updates" from QODBC Setup Screen About >> tab. By clicking on "Check website for updates" you will be redirected to below page on QODBC website. You can download QODBC latest released version by clicking on Click to Run QODBC Installer version hyperlink. 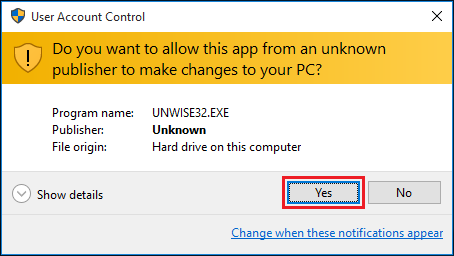 Click "Yes" to proceed uninstallation. 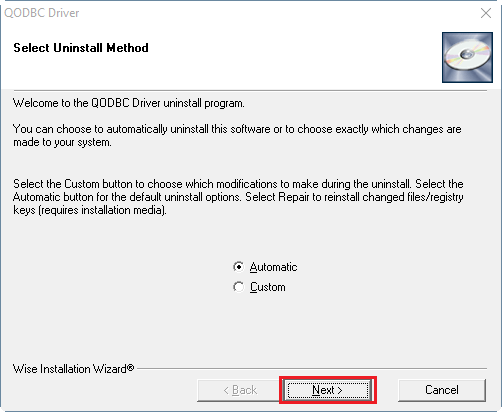 Click "Next" & "Finish" to complete uninstallation process. Now Install QODBC Latest version on your machine. Restart the Machine after the new version is installed (if prompted). 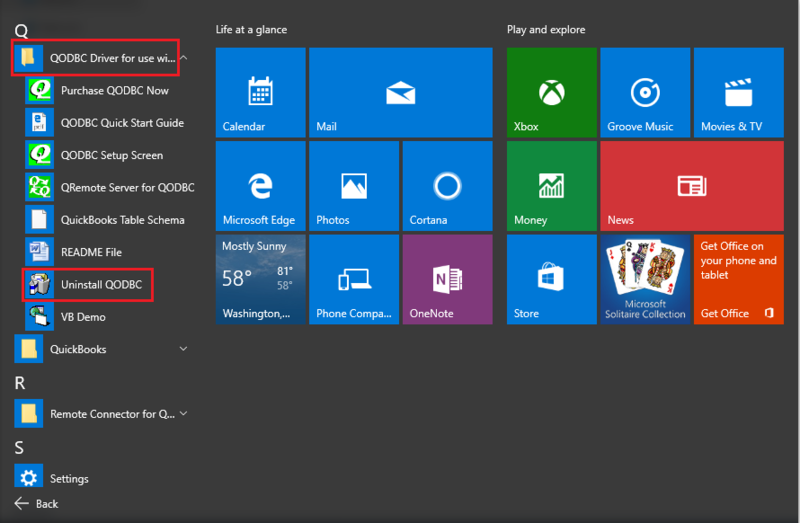 After installation of QODBC, You will be able to connect to QuickBooks Enterprise. It is working now but is taking forever to generate a report. do you have to purchase a new license after qb version 14 upgrade? I am told to activate. I activate, the program says successfully, via data source, and the program still requires activation. thank you. QODBC licensing is not upward compatible only backwards, meaning you would need a QODBC License for 2014 to work with QuickBooks 2014. When a new version of QuickBooks is released, we have to add the new version features that QuickBooks makes available to us such as new data tables, fields and any new reports included in the new edition. We also need to insure that all of the previous features and functionality that we made available in the past still work, along with any new functionality we add to QODBC such as the QRemote feature. The Read Only Desktop edition of QODBC is included with QuickBooks Enterprise Edition 14. Updated to the most recent version and it shows as registered however still getting the error message. Put in CD key since I did not see this before trying to fix the issue. This is the message we are getting: :Error Message: ERROR  [QODBC] This function requires activation of QODBC Read Write or Server Edition." We have the read write edition of the software. I would like to inform you that QODBC licensing is not upward compatible only backwards, meaning you would need QODBC License for 2014 to work with QuickBooks 2014. 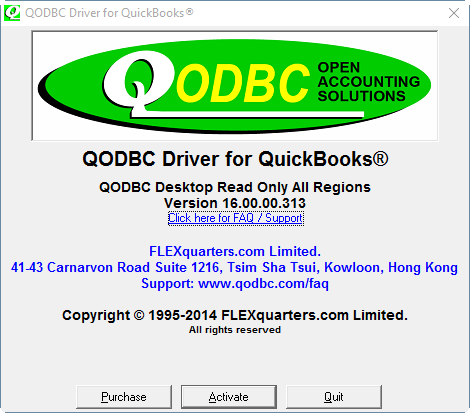 Version 14 of the driver will work with all editions of QuickBooks 2002- 2014 Pro and Higher. The Read Only version of QODBC is included with QuickBooks Enterprise Solutions 14. So you need to purchase/upgrade QODBC License 2014 to work with QuickBooks 2014. I am about to upgrade from QBES11 to QBES14. I presume same thing - install updated QODBC and follow above installation w/o CD Key. I would like to inform you that once you upgrade QuickBooks to newer version then you also need to upgrade QODBC license to write/update operation. QODBC is licensing is not upward compatible only backwards means you can read/write in QuickBooks version for which you having license or backward version of it. For example if you have QODBC license for 2013 to work with QuickBooks 2013. Version 13 of the driver will work with all editions of QuickBooks 2002- 2013 Pro and Higher. To work with QuickBooks 2014 either you need to upgrade your QODBC license or you can use your current QODBC license as a Read only for QuickBooks 2014.